Logo for Outdoor Gear Lab – David Safanda Design Solutions Inc.
OutdoorGearLab is an exciting new company that recently hired me to develop their logo. I was very happy with the result. Below is the final design and a short case study that describes the process. Outdoor Gear Lab is a brand new company founded by Chris McNamara, the creator of SuperTopo. 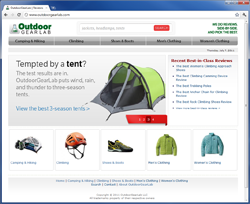 The OutdoorGearLab mission is to create world’s best outdoor gear reviews. Each product is put through a set of real world field tests. The result is side-by-side comparative reviews designed to aid a potential buyer faced with overwhelming choices. Logo development requires many different areas of design focus. Color, typography and illustration all demand attention. However, I think the single most important criteria is an understanding of the business in question. What does the business actually do and how can this be refelected visually? In this case I kept coming back to the concepts of “testing” and “outdoors”. I knew that I wanted to somehow combine these two subjects in an engaging visual symbol. The word “Lab” made me instantly think of a glass beaker. I’m sure there are other companies with “Lab” in their name that also use a beaker as a visual reference. However, I needed to somehow combine this idea with a connection to the outdoors. I wanted to do something a bit different. I wanted to drop a mountain range in to the beaker! My attention shifted to what this might look like. Once I had a beaker element that I was happy with I began the task of pairing it with typography. I experimented with dozens of different font faces in an effort to find something that felt contemporary and yet friendly and approachable. None of these initial variations were quite right. Eventually I found a font face on Veer.com called LFT Etica that had the character the client was looking for. Some additional design elements were added in order to pull everything together as a cohesive whole. Sometimes image is still king! Langtech’s new website is live!